Today I am trying a product set I was very much looking forward to. The sea salt spray and the heavy hold pomade from Dapper Dan. 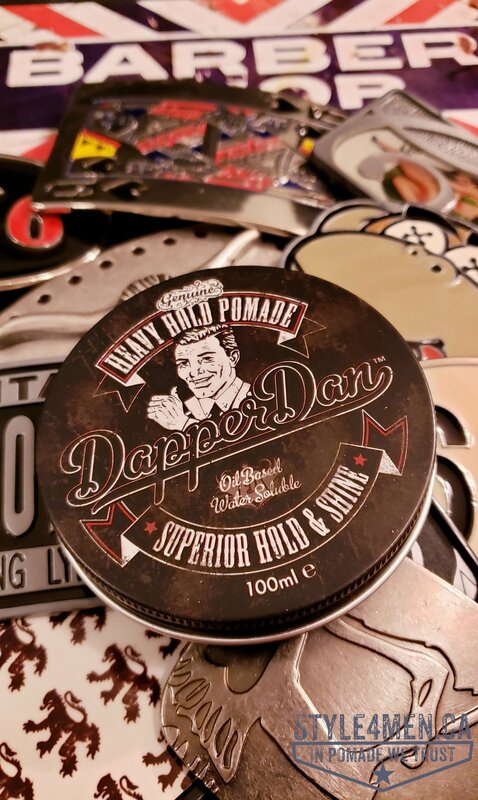 To situate you a little, Dapper Dan is a British pomade company that I first got to try about 2 years ago. At the time I worked with their Deluxe Pomade. The perfectly rendered “vintage-chic” metal can, the sweet orange aroma and honest product hold made me an instant disciple of Dapper Dan. Fast forward to today and the product offering from these guys has grown a little to include this new “heavy hold pomade” and “sea salt spray”. Shout out and thank you to Phil at d for trusting us in this process and making this review possible. As focused on products as I might claim to be, the product presentation and labeling still remains a big thing as it defines your first contact and first impressions. For my vintage penchants, Dapper Dan is a total winner. The proper metal thin can, colour selections and imagery all work beautifully together to give you a finished product that looks like it came from a different time. Fast forward to this morning and it’s test time! Coming out of the shower with clean and towel dried hair, I dispensed a few shot of the sea salt spray in my damp hair and blow dried. As mentioned in the unboxing video, a salt spray is a very interesting type of product that creates solid volume as the starting canvas for your final styling. I appreciate that the concept of using “two” products for hair styling is pushing it too far for most guys. I was certainly in that boat about 2 years ago. The pomade should be good enough to do the whole thing, would have pretty much summed up my views at time. Here is what there is to gain by using a salt spray. It will give lots of volume to your hair along with a little grit. The salt or grit element coats your hair and creates a small element of bonding. Don’t expect to be able to style your hair by simply using a salt spray. It’s more along the line of what your hair might be like after coming out of the ocean and drying. A “big” fun mess. Focus on the “big” here! The Dapper Dan salt spray has a nice and light musk like aroma and renders great volume. It even went as far as offering a bit more hold than expected for a salt spray. Bottom line, it produced a fabulous canvas for the next step which is the actual styling. So onto the “heavy hold pomade”. Upon opening the jar you are presented with an almost caramel like texture which gives out a sweet vanilla scent. The product is a bit firmer than expected when scooping it out. It reminded me of an old-school firm hold grease pomade. My reaction to this was to flip the jar over to double-check the ingredient list again. Yep, this is a water based product! The real test will come when washing it out. But in the immediate, the comparison to grease based pomade is the most accurate. So once scooped out I relaxed it in my palms and started applying it in my dried hair. It went it fairly smoothly as the product is already quite tacky and it’s going in to a slightly gritty surface. Don’t get me wrong, this was not a hard or unpleasant experience. Th e pomade is easy to apply and I did my usual back to front, side to side and front to back moves to evenly distribute the schmiere. At this point, you get an idea of the overall hold and look that you will be able to achieve. 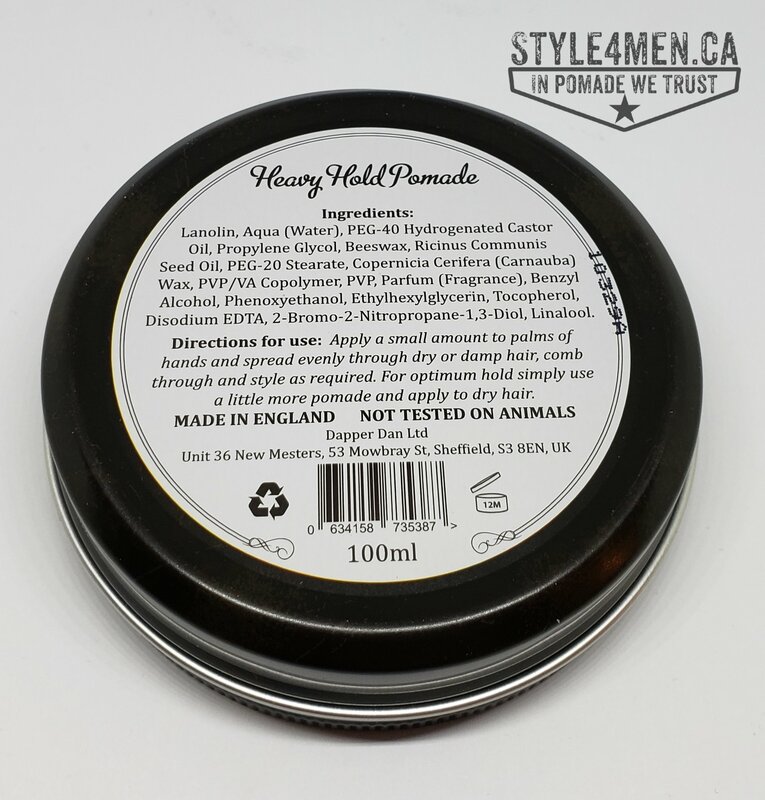 My hair had a nice shine, very much like it would with an oil-based pomade and the hold was totally honest. Because of the oil like behavior, it took me a bit longer to style than usual since the hair is rendered a bit heavier than with a pure water based pomade. Things obviously also dry at a different rate. That said I was able to get a very nice and shiny pomp. In fact, not having sported a shiny pomp in so long, I was quite pleased with the overall finish. Going through the day with this pomade, I was expecting to have to restyle my mope on a regular basis. Turned out that this wasn’t the case and the pomade held nicely. It is also pleasant to the touch as the heavy hold pomade does not remain active like a grease pomade would. That’s a good thing as you won’t turn off your partner if things get cozy. 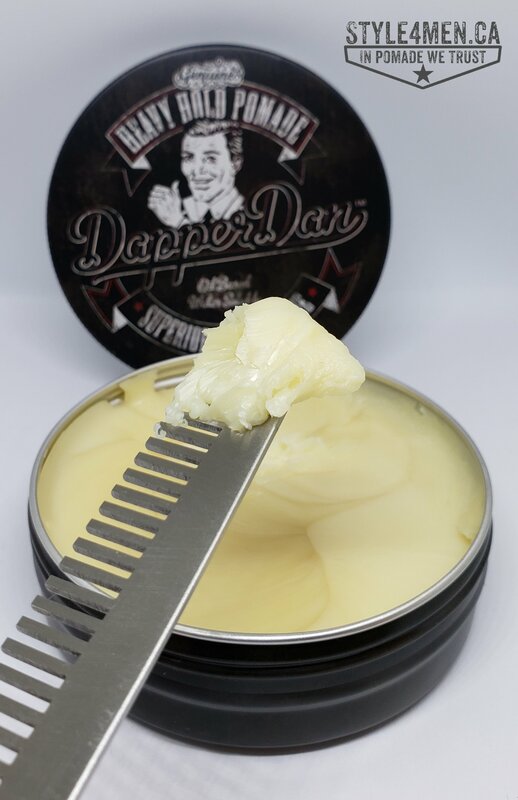 In closing, the heavy hold pomade from Dapper Dan looks and feels like an authentic old-school pomade at first but actually has all of the qualities of a modern water-based pomade. The sea salt spray is a great addition to their product line as it gives the Dapper Dan followers the ability to create a seriously impressive pomp. 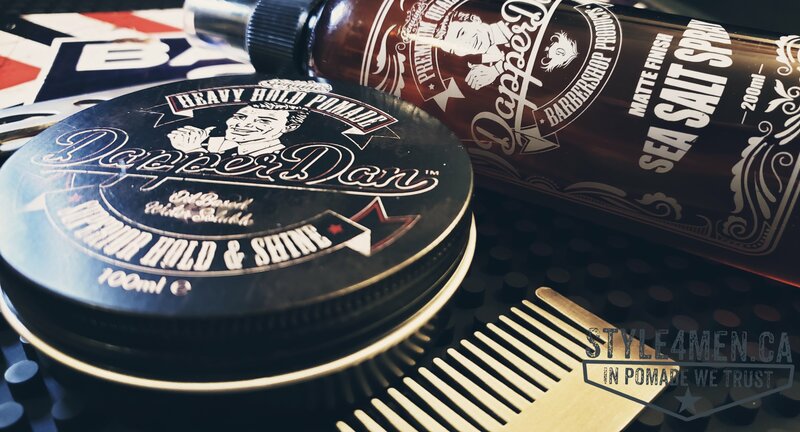 If you are looking for real hold, lots of shine in a uniquely looking vintage can, than Dapper Dan is your pomade!